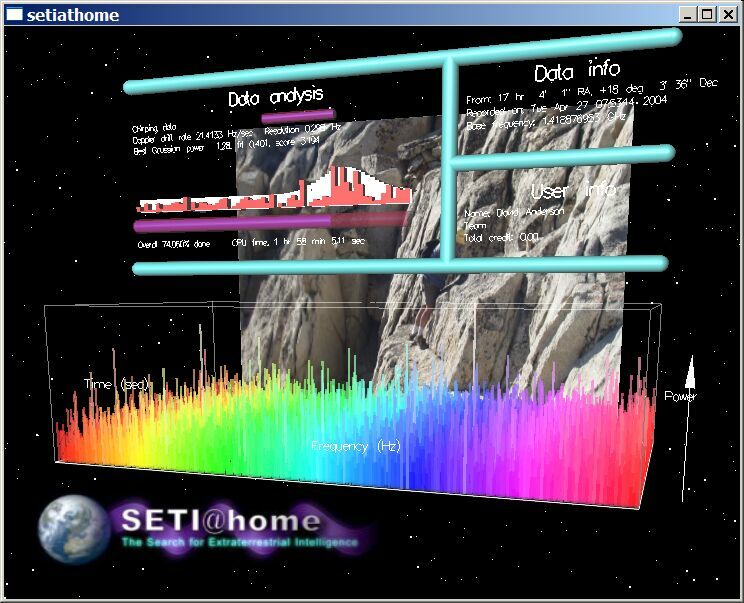 In a window: Using the BOINC Work Manager, you can open SETI@home graphics in a window: go to the Work tab, select an active SETI@home result, and click Show Graphics. You can interact with the graphics: to rotate, hold down the left mouse button and move the mouse; to zoom, hold down the right mouse button and move the mouse (On Macintosh, hold down the Control key and the mouse button to zoom). 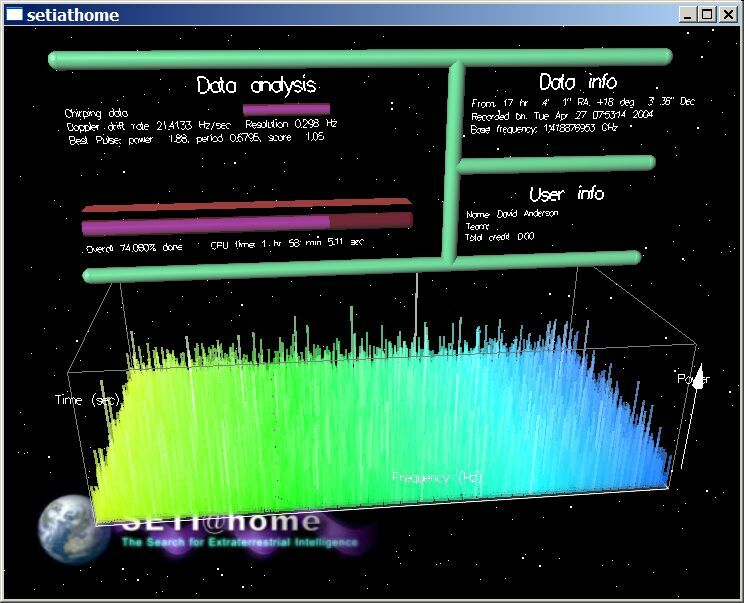 Screensaver: if you choose BOINC as your screensaver, SETI@home graphics will be shown when your computer is idle. Using the Settings button in Display Properties, you can tell BOINC to turn off graphics after a given time. In this mode, any mouse or keyboard activity exits the screensaver. 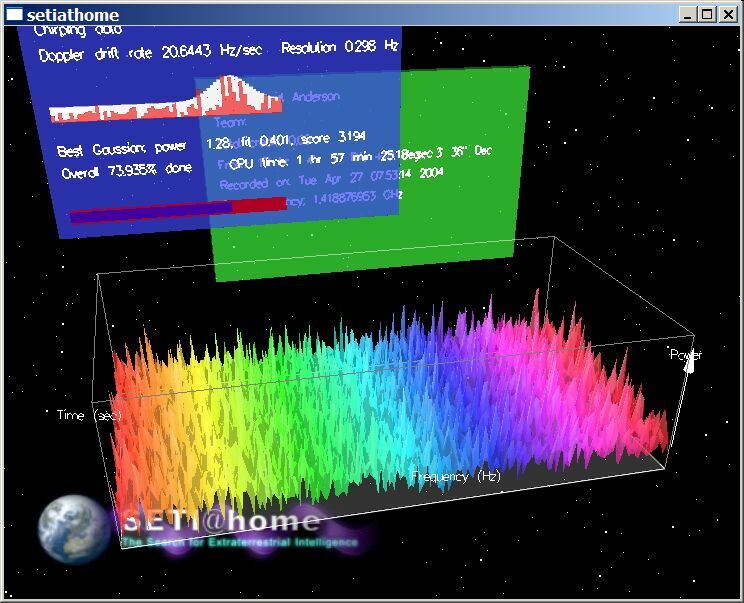 On most computers, SETI@home's graphics use the graphics coprocessor (such as NVIDIA or ATI), and don't significantly slow down computation. 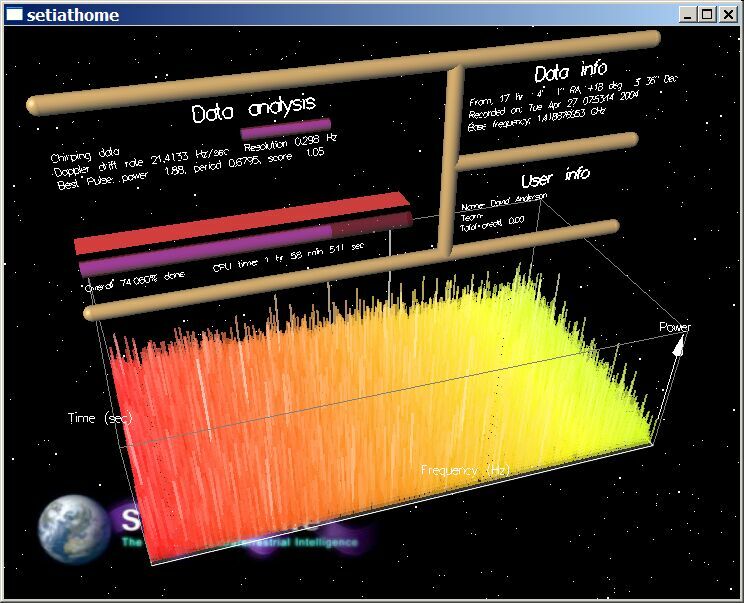 In your web browser, go to the 'Your Account' page on the SETI@home web site. 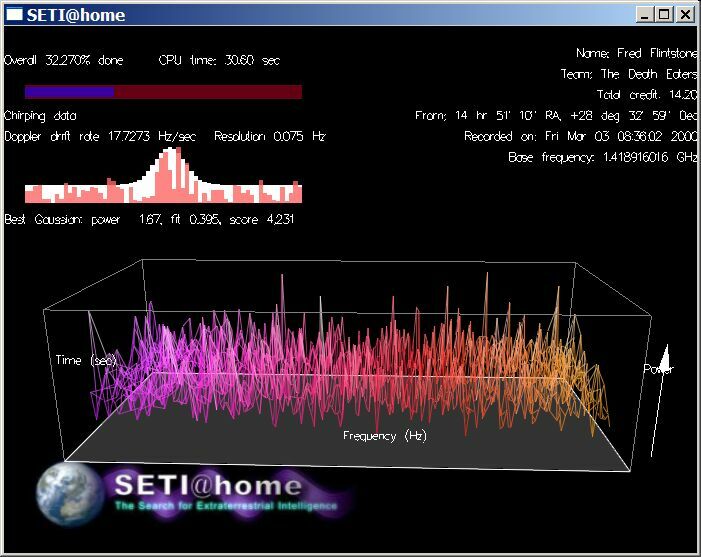 Click on 'View or edit SETI@home preferences'. 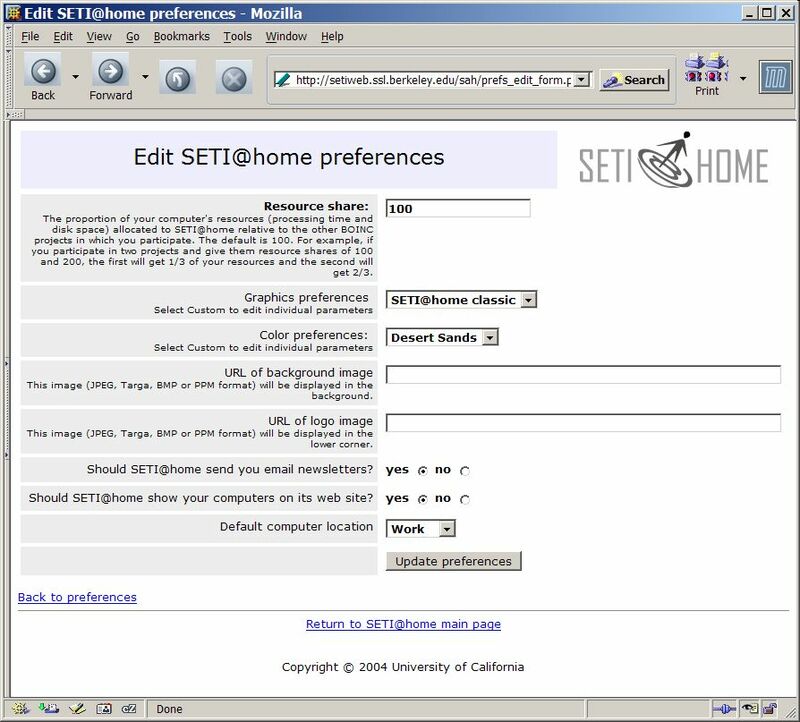 Click on 'Edit SETI@home preferences'. The form should look like this. Fill out the form (explained below) and click 'Update preferences' (note: the form also lets you control other items, such as resource share). 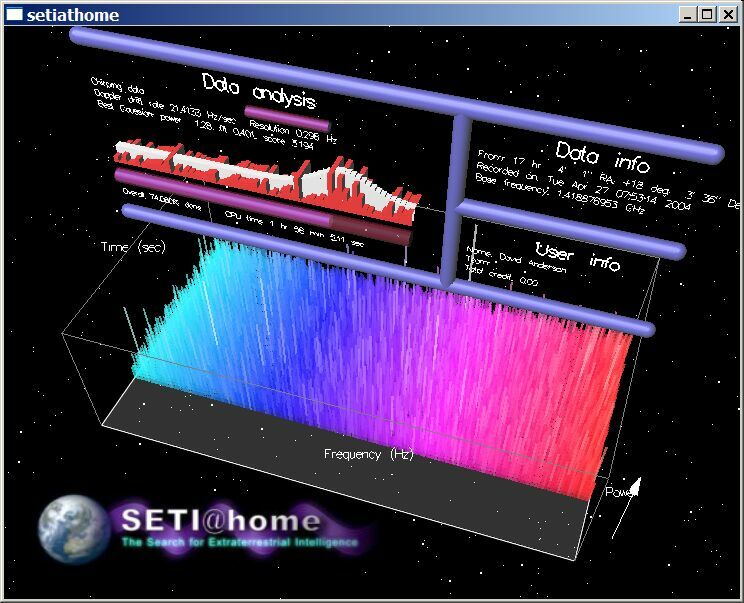 Open a SETI@home graphics window (see above). 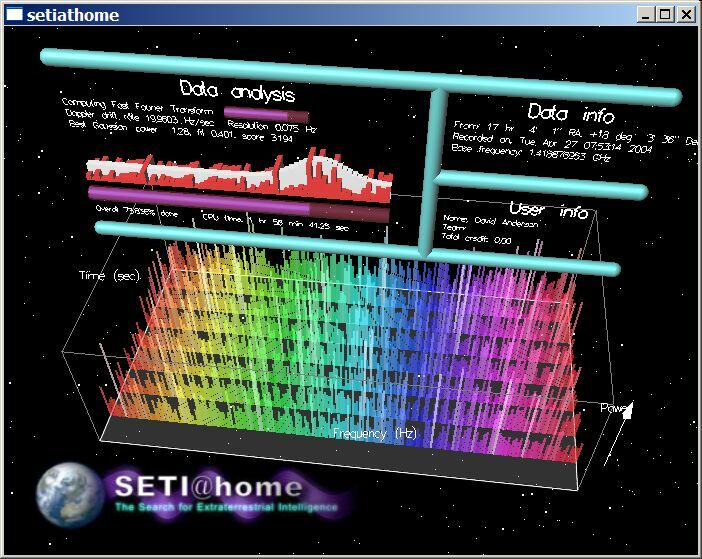 In the BOINC work manager, go to the Projects tab, select or right-click SETI@home, and click 'Update'. In a few seconds, the graphics will change to reflect your new preferences. Minimalist uses a 'heads-up text display' and omits the starfield. You can also specify an image to be displayed as a logo in the lower right corner. Same rules as for the background. Here's an example, with the logo of The Knights Who Say Ni! Maximum CPU% for graphics (the frame rate will be reduced as needed to obey this). Horizontal oscillation range (the angular range of the swivel). Vertical oscillation period (same, vertical swivel). To fine-tune your color scheme, set your Color preference to Custom, then edit your preferences again. First, a quick explanation about color. 'Hue' is number, ranging from zero to one, that determines color; 0.0 is red, 0.2 is yellow, 0.4 is green, 0.6 is blue, 0.8 is violet, then it wraps around to 1.0, which is the same red as 0.0. Start hue in graph: This is the hue of the left edge of the graph. Hue change in graph: This is the change in hue as you go from the left to right edges of the graph. It may be positive or negative. It can even be greater than one or less than minus one (this gives a multi-rainbow effect). These numbers determine other colors: the dividers in Pillars mode are given the color of the graph's midpoint, and the panels in Panels mode have colors that are 1/3 and 2/3 of the graph range.